The center of our universe. skin damage that can lead to discoloration,wrinkles and cancer. The sun’s light contains 3 types of ultraviolet rays (UVR) two of which can penetrate the earth’s protective ozone layer. Ninety-five percent of solar radiation that reaches earth is composed of UVA rays which age skin cells leading to long-term skin damage including wrinkles. UVA also plays a role in the development of some skin cancers. The remaining 5% of ultraviolet rays that affect us here on earth are UVB rays which are the main cause of sunburns. UVB rays also lead to most skin cancers. Exposure to UVR also suppresses the immune system which is an important factor in the eventual development of cancer. Tanning is your skin’s protective response to sun exposure. When exposed to UVR your body normally produces melanin (pigment protein) to try to protect the deeper layers of your skin from damage. Due to this fact people sometimes mistakenly assume that a “prevacation tan” obtained by laying out in the backyard covered in baby oil or visiting a tanning salon in preparation for a sunny vacation will protect against subsequent skin damage. Unfortunately, this flawed thinking actually results in extra radiation exposure not only before but also during the vacation when less sunscreen is applied because it is mistakenly believed that the tan is protective. The truth is that once you exceed your body’s allotment of melanin you will burn. When your skin is damaged by the sun’s rays, a greater amount of melanin is produced in an attempt to protect your skin from being damaged even more. As a result, your skin changes color. Dark-skinned people turn darker brown, or tan, when they go in the sun whereas light-skinned people turn more red and burn. Besides tanning or burning, a lot of people also get uneven patches of color or freckles following sun exposure. Even if you have naturally dark skin or never burn and always tan, you are not safe. The sun is still damaging your skin and you are still at risk to develop skin cancer and wrinkles in the future. Skin aging is the result of chronic unprotected exposure to UVR. These damaging rays weaken the skin’s elasticity and result in sagging cheeks, deeper facial wrinkles and skin discolorations later in life. 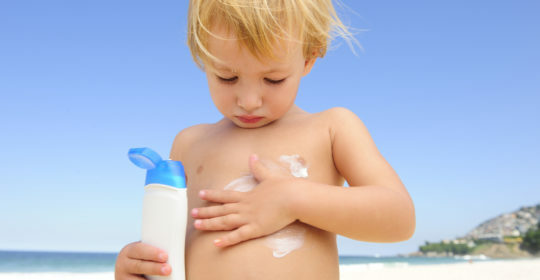 Twenty-five percent of sun exposure occurs before 18 years of age and use of sunscreen decreases precipitiously between the ages of 9 and 15 years as tweens and teens strive for more independence. Rules of Sun Protectioncan be divided into 2 categories: when to cover up and how to cover up. Sunburn is common. In the United States, approximately 70% of adolescents aged 11-18 years report being sunburned at least once in the previous year. Even though sunburn is self-limited, healing completely after a few days, it is a marker of an increased risk of both melanoma and non-melanoma skin cancers at all ages. When unprotected skin stays too long out in the sun, redness becomes apparent 3-6 hrs after exposure and continues to worsen until it reaches its peak after 12-24 hours. The redness usually subsides in 72 hrs. Skin cracking and peeling are noted 4-7 days later. If the burns are so severe that blisters appear, they heal without scarring in 7 to 10 days. Certain physical characteristics increase your chance of sunburn. These include light skin, blue eyes, and red or blonde hair. If you have a lot of moles on your body you are also more susceptible to sunburn. The amount of UV light reaching the ground depends on a number of factors, including the time of day, time of year, elevation and cloud cover. In general, UVA rays are constant but UVB rays are stronger between 10AM and 4 PM in summer months. They are also stronger the closer you get to the equator. If you do not have access to the official UV Index you can use The Shadow Test: if your shadow is shorter than you are, the sun’s rays are at their strongest, and it is important to protect yourself. shade is useful but because sunlight is scattered and reflected it can still get you. A fair-skinned person sitting under a tree can burn in less than one hour. clouds decrease UVR intensity but not to the same extent that they decrease heat intensity. When you do not feel as hot it gives you the misperception of protection from sunburn. you are not necessarily safe in your car, standard clear window glass absorbs UVB but not UVA rays.